PUH=LEAZE tell me you're going to post the entire costume soon! I am so EXCITED!!!! And don't forget to post the details and any tutorials for the DIY parts-- this blog is a continuing source of ideas (not to mention covetousness) for me. I recently made a smashed penny necklace that I have gotten tons of compliments on, thanks to your inspiration! I love it over the white glove! Can't wait to see the whole costume in all its steampunky glory. Wicked awesome! Are we going to get a step-by-step for the bracelet? Have fun at D.C.!! Can't wait to see the pictures! Well, I don't blame you. It's beautiful! Can't wait to see all the pics. Please post lots and lots! Very nice! I'm psyched to see the rest of the ensemble! I too am SO. EXCITED. to see you in your finished costume! The sneak peek alone looks awesome! Have fun you two crazy kids!!! Ah! It looks lovely, can't wait to see full pictures!! Tease! Can't wait to see the rest! Eee! So cool! Can't wait to see the whole thing!!! Costumes, Costumes, Costumes!! Oh my goodness, SO COOL! I can't wait to see all of it! Oooo I can't wait to see the rest of your outfit! That cuff is awesome! ohmygoodness i cannot WAIT to see your costume!!! so pretty!!! This is torture! I can't wait to see the whole effect. Please, please, please!!! I hope you have a TON of fun this weekend!!!! Very. Cool. Can't wait to see the whole ensemble! Beautiful picture! Can't wait to see the whole thing! I love the cuff bracelet, it is beautiful. I'm sure the entire ensemble will be awesome. Looking forward to seeing the whole thing. I hope lots of people want to take pictures with you because of your awesome costume! Have fun!! Oh my gosh WANT. I'm doing steampunk for the first time for Halloween this year, and just trying to find parts for everything let alone steampunk it up is difficult but SUPER fun! What is your favorite attacha-ma-stuff especially when working with metal and plastic? Good golly that looks beautiful. From what I can see, the color scheme looks absolutely lovely. And I adore that weaved belt! I hope there'll be full photos in the future if it looks that great from such a close up shot. I wish I could pop by Dragon*Con to see in person (along with all the other cool things going on there, lol), but alas this Arizonan can't be up and leaving state any time soon. Beautiful! I can't wait until the FULL preview! It will be a him and hers, right? Have a blast at Drag-con. wv: smerio-what toddlers do with cheerios. Aw, come on! That's such a tease! You are obviously going to look AMAZING just from seeing that tiny little bit of your outfit! But I gotta ask, what do you use to adhere all these awesome gears and bling to your projects? I loved the flux capacitor pin modification, for example, but have no idea how you made the lovely corner embellishments stick. Inquiring minds (who like to lift ideas and copy things) want to know!!! 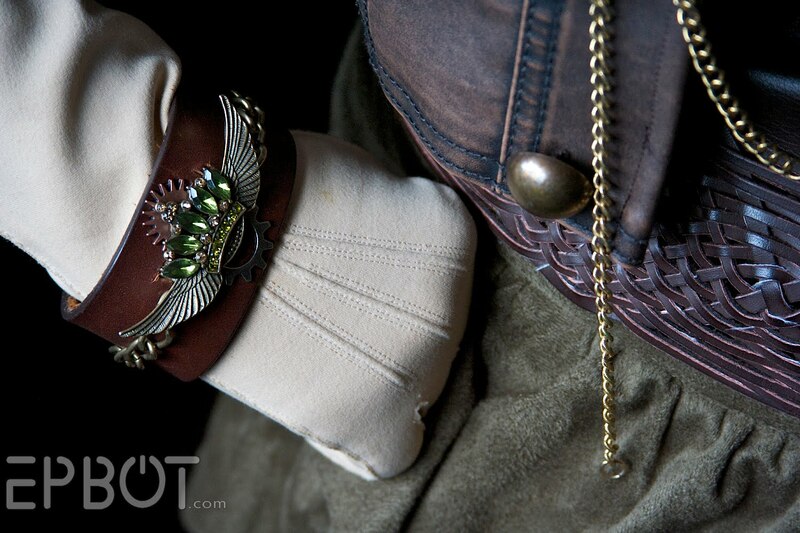 Okay... that bracelet/cuff is just awesome!! Very cool - can't wait to see the rest!! Such a perfect teaser photo! Can't wait to see the whole thing. I had an idea though: that button on your vest looks ideal to be replaced with one of your domed pennies you made for your curtains. Just a thought! Oh come on! Need...to...see...pretty costume! What a great teaser photo. I can't wait to see the rest! I had an idea though: Looks like that button on your vest would be perfect to replace with one of your domed pennies you made for your curtains. I hope that doesn't sound too stalker-ish, being all I know what your house looks like! haha. I'm going to be super jealous, aren't I? Yep. I'm going to be so jealous. Amazing! You have such a good eye. I never would have come up with such a great design! Can't wait to see the whole outfit! Have fun at Dragon Con for me. SO. COOL. Can't wait to see the full outfit! Looks like it is going to be amazing!! Your bracelet is way cool! Drool! The bracelet is just beautiful! So sad I didn't plan better and am not there AGAIN. Please post full pictures for those of us too ADD to get our priorities straight. And who have the creativity of a lump of coal. But skillz. Someone give me an idea and I can make it. So thank you for sharing. Now just start selling "kits" for assembly with some raw materials and an idea. If I had a bracelet that awesome. . . I might actually wear a bracelet. I love it. Can't wait for the rest! I get the feeling you're going as a steampunk princess (which, given what I know about you, seems entirely appropriate). Love the bracelet. Any chance we'll get a picture of you in full costume afterwards? Please? :) At least the full costume? *dies* Wow. That is one stunning cuff. I'd never take it off either! I cannot wait to see the rest of the outfit. Pretty darn amazing, Jen! Hope you and John have a wonderful time at the CON! Ooh, pretty. With the wings and crown it reminds me of the jewellery at this etsy shop, aka the creater of the bizenghast graphic novels. Which are delightfully creepy/gothic/victorian/ruffly. I can't wait to see more of your costume pictures, the skill and perseverance to put towards creating is very inspiring :). I'm going to put my money on Steampunk Wonder Woman. Very. Cool. I can't wait for pictures form Dragon Con!!!! Hurry up and come back! I had that exact belt! I say had, because although I loved it, it fell to bits. Watch out for that, because I've not found another one since! Looking fabulous though missie, hope you had a wonderful time. WV: poodip. Need I say more? have mercy, Jen! have mercy!! show the costume!! !